Two years after launching the Echo and kick-starting the smart speaker craze, Amazon is back with a brand new version of one of its most popular devices. 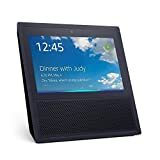 The Echo Show, as it has been named, is the first Echo device with a touchscreen, allowing for additional functionality over the standard Echo speakers. As expected, the Echo Show is also capable of performing audio and video calls using its eight microphones, 5-megapixel camera and 7-inch touchscreen display. Echo Show owners will be able to place hands-free video calls to other Echo Show devices as well as to friends and family who have the Alexa app on their mobile device. Calling and messaging with Alexa is free. In effect, the Echo Show can do everything the Echo does, but better. It supports music services like Pandora, Spotify and iHeartRadio, but it can also display lyrics, album art and curated playlists from Amazon Music. You can also ask Alexa to show you a cooking video on YouTube, find the latest Star Wars trailer, start a timer and let you see your calendar, all of which wouldn’t work on the Echo. The Echo Show also serves as a valuable addition to any smart home, as it allows users to view live camera feeds from the front door or anywhere else in the house. Plus, it’s compatible with connected devices from brands such as WeMo, Philips Hue, SmartThings and ecobee, so you can ask Alexa to show you the front door, dim the lights in the living room and set the temperature upstairs to 70 degrees. As for the technical details, the Echo Show features a 7-inch display, a 5-megapixel front facing camera, an Intel Atom x5-Z8350 processor, dual-band 802.11 a/b/g/n Wi-Fi support, dual 2-inch stereo speakers, and physical buttons for volume control as well as a button to turn the mics and camera on and off. Amazon’s Echo Show is available to preorder today for $229.99 and ships on June 28th. You can also save $100 if you put two Echo Show devices in your cart and use the code SHOW2PACK at checkout.